The highlight of this year was to have been tipped by Suzanne’s Files as one of the top ten cooking schools in Europe. The second was a publishing deal to release two books in Spring 2012. Two thousand and eleven was indeed a good one. We travelled, cooked and met inspiring people. Our cooking repertoire has expanded and our methods perfected. Last February we hosted a special class for the Olive Tree Scholarship Programme, City University, London. The programme brings together young Palestinians and Israelis for three years of study, reflection, exploration and debate in London. 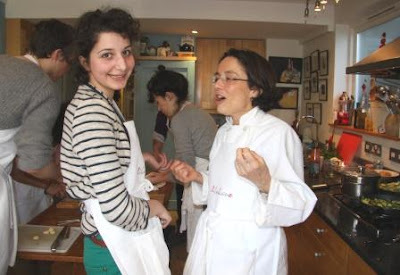 The Libaliano cooking class was a lively exchange of ideas and recipes and an enjoyable day away from academic study. I went to Peru to find out about New Andean cuisine. It was thrilling. I joined Cordon Bleu Peru and was invited into many restaurant kitchens. There I met young chefs out to make a difference and put their country on the culinary map. 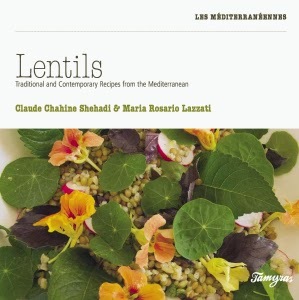 Back in Lebanon, we took on a new face and went public: we cooked for Tawlet a Beirut restaurant. There, we introduced a mix of Italian and Libaliano specialities using local ingredients. It was fun to watch the chefs trying to converse with Maria; unable to speak Italian or much English, they used the universal language of football and music. It was also great to hear feedback from journalists, amateur gourmets, and professionals. Finally we feel much cooler now that we have mastered twitter and revamped our website. We are concentrating on our books and still hosting classes. Come join us! And to wave good buy to 2011 here are two of our favourite recipes. I love this dish because it is simple and tasty. It is perfect served as a main course with salad, on the other hand it works brilliantly as an accompaniment to meat or poultry. Rince and strain burghol; set aside. Finely chop onions and garlic. Gently fry onions with a little olive oil, for about 3 to 4 minutes than add garlic and cook for another 2 minutes. Now add the chopped tomatoes and leave to cook for 3 more minutes. 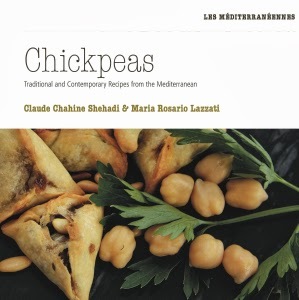 Add burghol and chickpeas. Add allspice, black pepper and salt to taste. Pour the stock over and bring to the boil. Lower the heat and leave to cook for 20 minutes. Roast the pine nuts in a hot oven for 6 to7 minutes. Once the burghol is cooked leave it covered and allow it to rest for 10 15 minutes before serving warm and garnished with pine nuts. Roll out the pastry sheets. Cut into 4 equal pieces. Fold the long side of each piece in about 2 cm. Press the folded section down then fold once more making three creases in each. Cut the unpeeled pears into 1/2 cm slices, discard the end slices. You will need four slices on each galette. In a large heavy based pan combine rind, juice, water, caster sugar and sliced ginger. Bring to a boil and add pear slices in batches to syrup. Leave to cook, covered over low heat for 10 minutes or until the pears are just tender. Remove pears with a slotted spoon reserving as much syrup as possible. 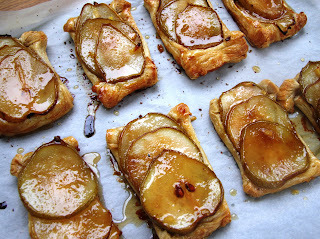 Place the cooked pears on the pastry base. Sprinkle with the brown sugar and place two small pieces of butter on each tartlet. Bake in the oven for 20 minutes until it is a golden brown colour. Meanwhile, boil the reserved syrup for about 10 minutes or until reduced to a thick brownish glaze. Brush the hot galettes with this glaze.